Service is at the core of all we do, and the fan experience is at the forefront of our approach to tailgating. That means setting our customers at ease, anticipating their needs, and exceeding their expectations. We know how grueling tailgating can be and we created Tailgate Guys to lighten fans’ burdens. We focus on every detail—from perfectly aligning the tents to making sure that each cooler opens the right way. We reserve our guests’ parking spaces and meet them at their cars to help haul their stuff to the tailgate. We bring the highest level of care to our process, because we operate on a foundation of excellent service and attention to detail. Tailgate Guys continues to set the standard in athletic event management, and that means our commitment to detail doesn’t end when football season concludes. We work year-round to ensure that come game day, all of the tents, tables, and chairs are ready to go. Our return customers hear from us in the Spring and have their plans for the upcoming season taken care of. If you have a need or request you don’t see addressed here directly, contact us to get answers from a member of our staff. 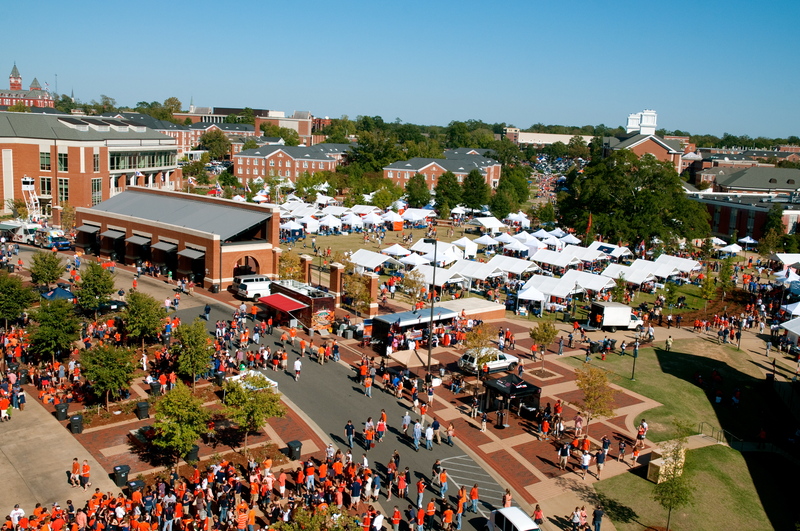 We offer packages that can accommodate tailgates of almost any size. From a simple 10 x 10-foot tent with a table and chairs for a small family to an elaborate large-scale event with catering, beverages, and game day media—we can cover it all. Find details on the specific packages relevant to your campus on our locations page. Drop Off / Bellhop Services - Our bellhops meet our guests at their car, load a wagon full of tailgate gear, and haul it all to the guest’s tailgate location where they unload and help set-up. Options for DISH Media Packages - DISH is the Official TV Provider of Tailgate Guys, which allows us to provide a best in class media set-up on gameday. Complete with 43” mounted TV’s featuring DISH’s premium sports programming, we provide all the college and NFL games happening throughout the day and all season long, live at your tailgate. You’ll never miss a key play or rivalry moment with a DISH Media Package. For more information about DISH TV for your home, tailgate or business, CLICK HERE. Options for Catering - We work with local catering partners to provide a variety of food options. We manage all aspects of catering for our guests from booking to arranging for delivery. Options for Parking - Parking is unique for each campus and location, but our team can help arrange for and navigate parking options for guests. Services vary according to location. For more details and package options, please choose a location.